Overview -- As the company's flagship 2018 display model in the US, the Hisense H9E Plus offers a solid array of features for an affordable price -- including HDR10, Dolby Vision, wide color gamut, and Android TV functionality with integrated Google Assistant support. But while a decent performer overall, the TV's picture quality can't quite compete with similarly priced models from other brands. Likewise, the set is prone to a few bugs and glitches that could prove frustrating. At a current sale price of $549 via Best Buy, the TV is Worth a Look, but there are simply better looking displays available from other manufacturers for just a little bit more. The value-priced TV market has evolved dramatically in the last few years. Thanks to increasingly completive specs from companies like VIZIO and TCL, there are now displays available for under $1,000 that manage to hold their own fairly well against some TVs that cost double the money. And with the H9E Plus 4K Android TV, Hisense aims to join that roster of best bang-for-your-buck displays, offering a pretty impressive list of features in an attractive, budget-friendly package. But can the TV truly hold its own against other leading displays in this category? Well, let's take a look! 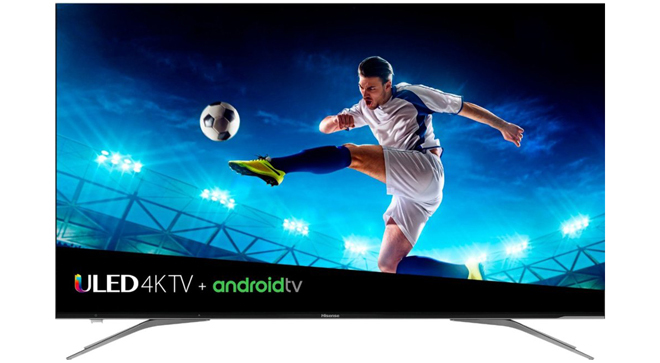 The 2018 H9E Plus 4K UHD Android TV is available in 55-inch and 65-inch screen sizes. The 55-inch model received for this review uses a VA LCD LED panel with a 16:9 aspect ratio, an Ultra HD resolution of 3840x2160, and a 120Hz native refresh rate. In addition, the panel features an edge-lit backlight with local dimming, HDR10, Dolby Vision, and wide color gamut support. While not as premium as flagship units from brands like Samsung and Sony, the H9E Plus features a simple but pleasing aesthetic with a thin black plastic bezel and silver metal feet. And thanks to the set's edge-lit panel, the top half of the display features a very slim profile, measuring less than ½ an inch thick. With that said, the bottom half of the screen (which houses the inputs and video processing) does need to protrude a bit more, coming out to 2 inches at its thickest point. As a whole, the TV measures 48.5"W × 31.1"H × 8.8"D and weighs 41.01 lbs with the feet attached. A power jack is included on the right side of the panel while all of the TV's video and audio ports are housed on the left side. 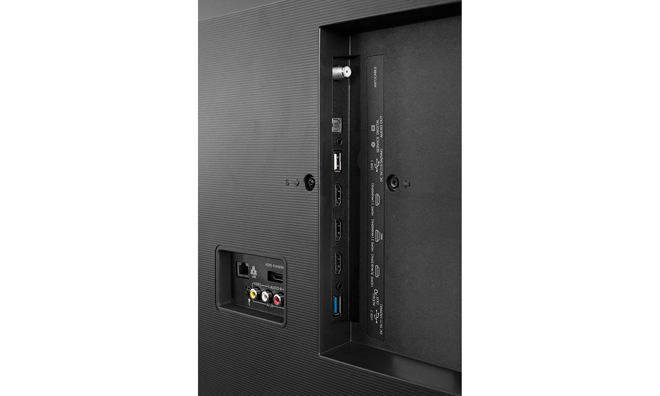 Connectivity options include four HDMI inputs, two USB ports, one RF antenna port, one RCA composite video input (shared with component), one Digital audio optical output, one Earphone/audio output, and an Ethernet port. In addition, the display offers Dual-Band Wi-Fi support. Under the hood, the TV is powered by the Android TV platform with integrated Google Assistant functionality and a Bluetooth voice remote control. 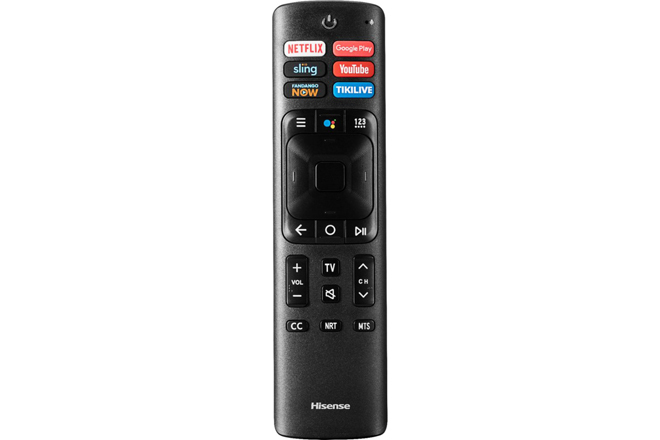 The remote itself features standard click buttons for Power, Channels, Volume, Play/Pause, Home, Back, Settings, and Voice Search, along with quick launch buttons for Netflix, Google Play, Sling, YouTube, Fandango NOW, and Tiki Live. Though perfectly serviceable, the remote has a fairly cheap plastic feel and the navigation buttons are all flush with one another which can make feeling your way around the controls a little clunky when watching in the dark. For those who don't have a separate sound system, the TV features integrated 10W x 2 stereo audio. In general, playback through the built-in speakers is adequate for casual viewing and about on par with other TVs in this price range -- but you'll definitely want a separate sound bar or receiver/surround sound setup for home theater use. After unpacking the set, attaching the stands, and powering the system on, setup is similar to other modern Smart TVs, guiding users through a fairly painless configuration process with steps for language and time zone selection, terms and conditions, Google account syncing, initial app installations, updates, and remote control pairing. Outside of the preliminary setup, the display also offers a nice assortment of standard Picture adjustments for each input, allowing buyers to calibrate the display for accuracy or to their liking. For general SDR playback, users will get the most accurate out-of-box dark room performance using the Calibrated picture mode with the color temp set to Low and all unnecessary processing features turned off. For HDR playback via HDMI, users will also want to make sure that the Enhanced HDMI setting is toggled in the picture settings menu for the corresponding input. When HDR10 or Dolby Vision content is played, an appropriate notification badge will flash toward the top right of the screen. Users will get the most accurate out-of-box HDR10 performance using either the Standard HDR or Calibrated HDR picture mode with all unnecessary processing deactivated. Meanwhile, for Dolby Vision playback I ended up preferring the Dolby Vision Dark preset since this seemed to offer the best balance between black level performance and highlight detail. Unfortunately, however, I ran into several glitches and bugs related to the display's picture settings, causing the TV to randomly revert to different settings on its own. Though infrequent, the display seemed to occasionally turn off local dimming or activate motion smoothing despite the opposite options being selected. Likewise, when starting HDR10 playback through streaming apps from a Fire TV Stick 4K or Blu-ray discs from an LG UP970, the content would often start to play with an oddly washed out look marked by elevated black levels -- as if the display's HDR processing was not kicking in correctly. Thankfully, in all the above instances toggling through different picture modes and then back to the desired mode in the settings menu would seemingly trigger the correct picture processing back on. But while correctable through that extra step, the fact that the settings didn't always play properly from the get-go proved to be frustrating. And sadly, though Dolby Vision playback worked fine through the TV's internal streaming apps like Netflix and VUDU, I encountered some notable issues when trying to watch Dolby Vision Blu-ray discs through my LG UP970. Most troubling, the video would repeatedly stutter for a split second during cuts from one shot to the next on all the DV discs I tested. Though subtle in slow moving scenes, the stuttering became a big problem during fast cutting action sequences. Black levels and contrast would also fluctuate subtly in isolated titles like The Matrix during certain shots, and black bars would sometimes appear brighter than they should. I've heard of similar Dolby Vision compatibility issues with some HDMI devices on other TVs, but this is the first time I've experienced any problems with the format myself. I'm not sure if the glitch is isolated to just this specific 4K Blu-ray player when paired with the version of Dolby Vision on this TV, but the stuttering essentially made those discs unwatchable for me -- negating one of the display's main selling points. Though it lacks the superior full array implementation found on some other value-priced models, the H9E Plus does include support for Edge-Lit Local Dimming. This technology uses LED light sources positioned in dimmable zones across the edge of the panel, allowing the screen to brighten or darken in selected sections. Unfortunately, while they can still offer some improvements in black level performance, edge-lit zones are not capable of the same level of precision that full array zones are known for. With that in mind, the local dimming here proved to be a little lacking during my testing, failing to match the inkier look of competing models like the VIZIO P-Series or TCL 6-Series. Likewise, the edge-lit zones could cause noticeable vertical segmenting when the LEDs became active, resulting in blooming artifacts in columns across the screen that could be a bit distracting. Still, despite these clear drawbacks, the High local dimming setting did help the panel to achieve slightly deeper blacks and superior contrast with most SDR and HDR10 content. It should be noted, however, that for whatever reason, local dimming is not an option when watching Dolby Vision material. To demo the TVs 4K HDR playback, I watched a variety of Ultra HD Blu-ray discs along with streaming content from services like Netflix, VUDU, and Amazon Prime Video, including titles like The Matrix, Wonder Woman, Kong: Skull Island, Fantastic Beasts, Blade Runner, Ex Machina, La La Land, The Tick, Jack Ryan, Altered Carbon, and The Haunting of Hill House. Outside of the picture processing glitches mentioned in the Setup section, HDR10 and Dolby Vision playback were both generally pleasing with strong fine details, punchy contrast, decent shadows, and vibrant wide color gamut performance. With that said, the TV's peak brightness specs are restrained compared to some other models in this price range. For the most part, nits in Calibrated and Standard modes maxed out at around 350, with one test pattern window spiking closer to 480. For comparison's sake, some VIZIO and TCL displays with a similar MSRP are capable of peak brightness in the 700 to 1,000 nit range. Of course, numbers only tell part of the story and, in practice, I was actually impressed by how intense specular highlights could look in certain titles. The glowing green code in The Matrix proved to be particularly striking, while pulsating blasts of magic in Fantastic Beasts radiated from the screen with eye-catching luminance and a fiery explosion in Kong: Skull Island carried an aggressive pop. At the same time, details were still preserved well, avoiding pesky blooming. Meanwhile, colors were especially impressive in La La Land, offering a sumptuous assortment of primaries during the "Someone in the Crowd" dance sequence without bleeding or becoming overly harsh. Likewise, Altered Carbon once again proved to be great demo material, bathing the screen in neon hues that came through with accurate saturation. Blacks and shadow detail were also pretty solid throughout my evaluation, but the edge-lit backlight did leave a bit to be desired when watching content in a home theater environment, resulting in a comparatively flat appearance in dark scenes with some visible clouding from time to time -- especially in Dolby Vision material since that mode did not allow for local dimming. As a whole, overall picture quality was decent with a variety of movies and TV shows, but compared to the competition in this class, the H9E Plus just isn't quite on the same level. Playback still benefits from the set's HDR capabilities, but the peak brightness and edge-lit local dimming limitations here do hinder the display's overall performance. Beyond 4K HDR content, I also sampled several HD and 4K SDR titles, including Star Wars: The Last Jedi, Avengers: Infinity War, Black Panther, The Unbreakable Kimmy Schmidt, and Solo: A Star Wars Story. Though not as vibrant or eye-catching as HDR playback, the H9E Plus offered pretty strong SDR performance with everything I sampled, rendering good Rec. 709 colors, solid contrast, and great clarity whether displaying native 4K material or upscaled 1080p content. With that said, the TV's edge-lit black levels and dimming did detract from certain titles, especially when watching in a dark room. Solo and its often dim and drab photography proved to be especially problematic in this regard, resulting in a noticeably flatter and murkier appearance with washed out blacks compared to full array LCDs I've watched it on. When it comes to overall screen uniformity, the H9E Plus performs similarly to other models in this class. When displaying full-screen tests patterns for various colors and shades of grey, some slight fluctuations in brightness and hue could be seen in different areas of the screen, with a subtle green/yellow push in the center and magenta push on the right side. A mild dirty screen effect was also visible in fast-moving content against light backgrounds (like a hockey game), but these imperfections were all generally within the expected range for a panel of this type. Meanwhile, with local dimming disabled, black uniformity was quite decent for an edge-lit panel, but some clouding and bleeding were visible toward the four corners. Activating local dimming could help to reduce the clouding but at the cost of introducing blooming pillars in some material. Sadly, viewing angles were not particularly good here, with contrast and colors taking a big hit when viewing the screen just slightly off to the left or right of center. In fact, HDR shows with more neutral, monotone, or black and white palettes like The Haunting of Hill House and Roma produced unwanted shifts in color on the left and right of the screen even when sitting directly in front of the TV. Finally, the display handled reflections pretty well in my setup, but dimmer scenes could still be prone to reflected images when watching in a bright room. Powered by the Android TV platform, the H9E Plus offers an extensive selection of streaming apps, but there are some notable omissions and limitations. For one, Amazon Prime Video is not included at all. Second, HDR and Dolby Vision playback are currently limited to just Netflix and VUDU. FandangoNow, Google Play, and even YouTube are all restricted to SDR. Those latter two are especially disappointing considering they're Google apps and this is a Google OS. And while VUDU played back HDR content just fine, the TV oddly does not allow you to adjust HDR settings when using that app. In order to pull up the HDR settings, an HDR video must be playing, but when you toggle the menu open when a VUDU title is playing, the app automatically stops playback. This causes the settings menu to revert back to SDR options. Unless I'm missing something, this makes it impossible to change picture settings for HDR videos in VUDU -- which is especially troublesome for HDR10 titles because the default HDR10 playback mode is very inaccurate and has motion smoothing enabled. Beyond those quirks, general navigation and playback for all the apps proved to be responsive and pretty smooth during my testing, though honestly, I'm just not a big fan of the Android TV interface itself. Compared to some other platforms, it's a little clunky and visually drab. Finally, the TV also integrates Google Assistant functionality with voice search. In practice, this worked well, allowing me to search for various apps, movies, TV shows, weather updates, and other information through simple voice commands. There were times when certain requests got misinterpreted, but overall the feature was on par or better than similar offerings on other TVs. And for users invested in Amazon's hands-free ecosystem, the display also offers support for Alexa control via a separate Echo device. Offering a nice assortment of features for its price, the Hisense H9E Plus Android TV has a lot going for it. Unfortunately, however, a few key issues and limitations hold back the overall value here compared to other competing models in this class. Overall picture performance is solid, but HDR brightness capabilities are a little restrained, viewing angles aren't great, and the TV's edge-lit local dimming can't match the precision of a full array model. And though the Android TV platform includes a good assortment of apps, I ran into some pesky glitches and picture setting anomalies, including persistent stuttering and isolated contrast issues with Dolby Vision discs via HDMI on my Blu-ray player. When placed against competing options available for just a bit more money, the H9E Plus just can't quite match other value-priced models from TCL and VIZIO. Likewise, Hisense's own upcoming 2019 4K HDR lineup is poised to offer a lot more bang-for-your-buck via the company's new full-array local dimming H9F and H8F models. At an MSRP of $699 for the 55-inch model or $999 for the 65-inch model, the H9E Plus is usually just a bit too expensive to recommend. 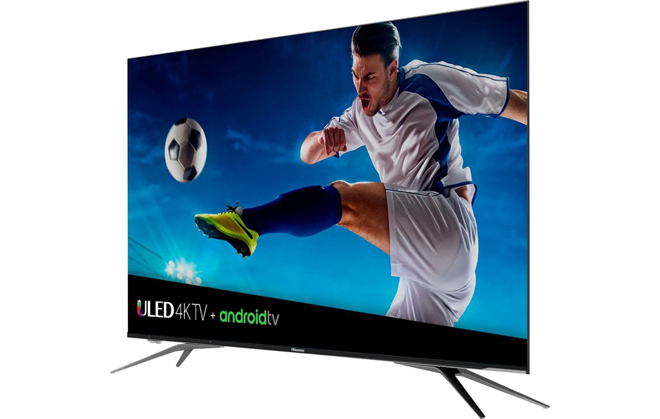 With that said, current Best Buy sale prices offer a much more enticing deal at $549 for the 55-inch or $799 for the 65-inch -- making this one of the cheapest 4K TVs with Dolby Vision and wide color gamut support you can buy. If you can't wait for Hisense's 2019 lineup or afford a bit more for the competition, this model remains Worth a Look.